Having two premieres within 24 hours was amazing, exhilarating, and tiring. 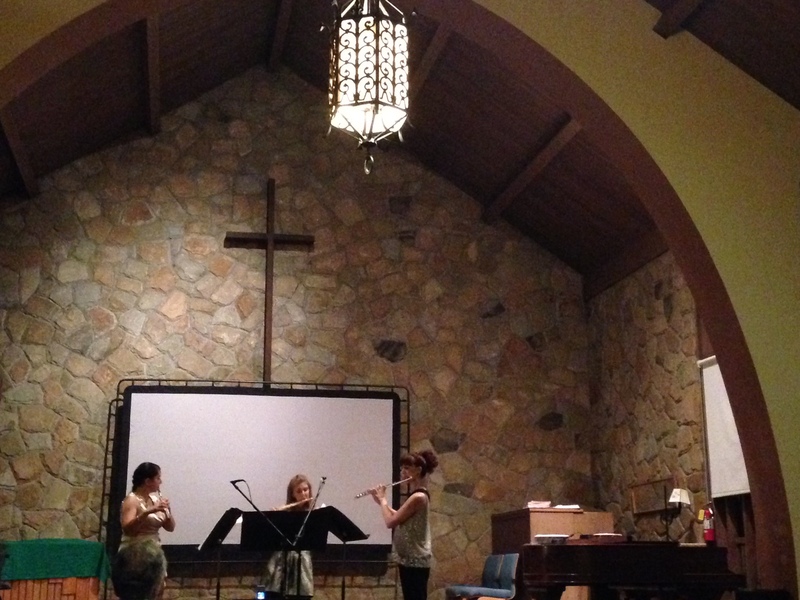 Both Areon Flutes and the Mobius Trio did awesome amazing jobs on all of the music that they played this weekend. Unbeknownst to me at the time, on Saturday night when Areon was premiering Spirals Slinkies Staircases (as well as, among other things, recapping a decade-old gem by Noah Luna), Mobius was premiering a new work by the awesome Santiago Gutierrez Bolio, which they then recapped the following day at their concert at C4NM. 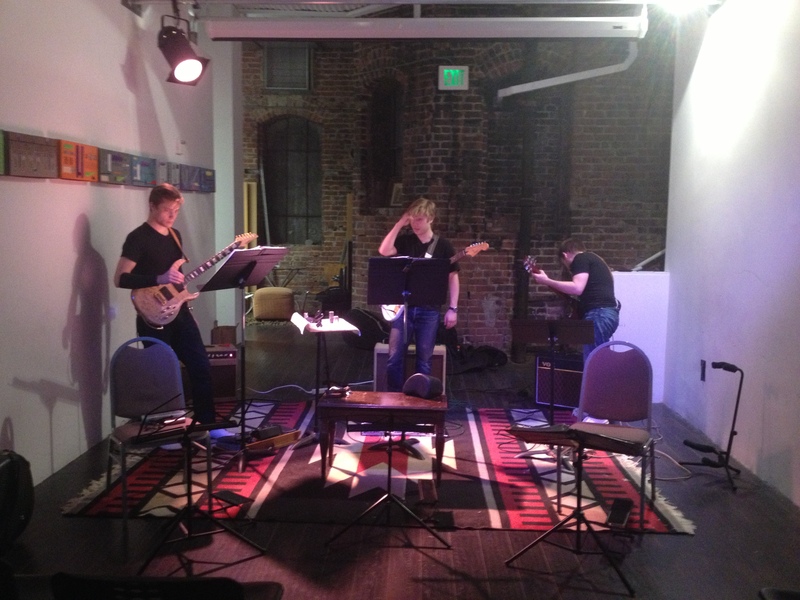 At that concert on Sunday, Mobius opened with a three year old piece by Danny Clay before moving on to the Radio Edit of my new piece for them, Initial Darkness. They closed the concert with another new work, Infinite Earths, by the astounding Mario Godoy. Those stories are a very tiny testaments to one of the things that make these groups awesome, especially from a composer’s perspective, which is that they will continue to perform pieces. It is already a tired lament in the new music community that far too often pieces get premieres, and then no second performance. Fighting this was one of the main impetuses behind the founding of the Fifth Floor Collective (of which I had a small part in, and who also had a concert last night in Boston). But groups like Mobius and Areon bring a very special dedication to the music that they ask for and perform. This goes all the way through their entire preparation (Santiago mentioned to me yesterday, after sound check, at his awe that everything that Mobius was spending time to checking and setting up, was all in service to giving the best performance possible of these works), to continue to perform the works, sometimes even for years. I am very fortunate that Areon and Mobius will both continue to perform the works I have written for them throughout this season. Mobius is making a small tour to the NYC area, I’ve posted the shows where they are planning on playing Initial Darkness. Areon as well will be playing some cool shows later this season, and I will be posting those dates once I have confirmation. Every musician knows that performance of works only continue to get better with time and practice, as was very clearly evident this weekend by the performances of Noah’s and Danny’s music. I am excited that these pieces will get a life outside of this past weekend and I look forward to seeing all of the nuanced ways in which they change and grow over the season. Looking ahead, there will be news about a new work I have written for the Guerrilla Composers Guild, and if you don’t already, keep an ear out on Music from Other Minds.